Home › FAQ › What are Different Ways to Specialize an Education Degree? What are Different Ways to Specialize an Education Degree? With all of the different ways to specialize an education degree, future educators can begin to build the knowledge and skills to pursue a path that best fits professional goals. Whether looking to work in or out of a classroom, education professionals can complete courses and training in various specializations. In order to deliver a quality education to all students, training in specific areas of education is necessary to gain the specific skill set required to effectively teach and guide students. For many educators, the initial specialization to choose at the undergraduate level is early childhood, elementary, or secondary education. 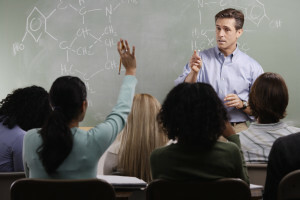 These programs include courses such as theories of instructions, classroom management, and assessment techniques at each respective level. Additionally, specific courses such as child literacy and adolescent development are completed based on grade level. Students pursuing degrees in secondary education also choose specific subject areas to concentrate in such as mathematics, reading, science, music, art, and physical education. Each specialization requires completion of course work in a secondary or elementary degree, along with additional courses such as diagnosis of reading barriers or kinesthetic, depending on the specialized area of education being pursued. Other specializations for future educators pursuing positions to teach in a classroom include special education, English as a second language, reading and literacy, and adult learning. Many of these specializations will require completion of a graduate degree. For every classroom teaching specialization, students for both undergraduate and graduate programs will complete classroom observation, field work, and student teaching as well. Additional information on in-demand specializations for classroom teachers can be found at the National Education Association website. In addition to graduate degrees focused on preparing future teachers for the classroom, many specializations in education are also designed for future administrators. Popular specialization in this area of education include education curriculum and instruction, educational administration, educational technology and instruction, and educational leadership. In these programs, future educational administration professionals complete courses that help in the management of various areas. Course work might include financial management, facilities management, equity in education, school policy and law, education regulations, and evaluation and assessment of programs. More information on specializations for education positions outside of a classroom can be found at the American Association of School Administrators website. Completion of an undergraduate or graduate degree in any of these specialized areas of education is an essential step in pursuing a career in a classroom position or administrative post. Qualified education professionals are also in high demand in other types of positions outside of private and public school districts. Career possibilities include finding positions with government agencies, non-profit organizations, textbook and courseware publishers, educational technology firms, and educational support companies. Trained educators are also in demand for positions in corporate training, health care settings, and software development companies. Whether pursuing a position as a classroom teacher or a school superintendent, working in education can be personally satisfying and professionally rewarding. With all of the different ways to specialize an education degree, the right path to completing the qualifications to make a difference in the lives of students from early childhood to higher education can be accomplished.